1. 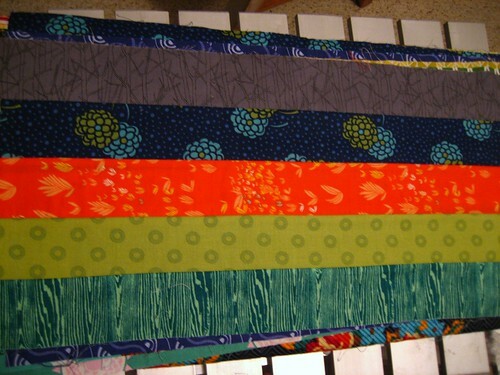 Rainbow Meadow: After changing plans, I’ve cut all the fabric but haven’t completed any sewing yet. 3. Metro Medallion: the top is done but I need to sort out a back, quilt, and bind. 4. Scoop Neck Pullover: I’ve knit the front, back, one sleeve, and a bit of the second sleeve. 5. Jeweled cowl: It’s probably 75% knit and I’m puttering away on it. Yup, those last two are knitting projects. I’d like to finish both while it’s still winter and there’s a need for woolens. Today is 16 degrees F and dropping. 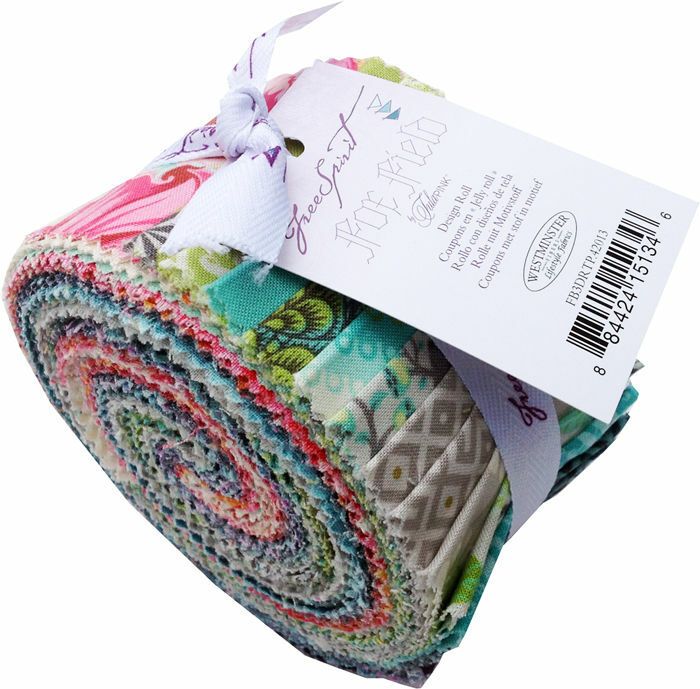 So: woolens and quilts are necessary! Remember my summer Finish Along goals? Remember how I completed… one project? Yeah. They were pretty lofty goals. For Q4, I’m going to try and be reasonable and only goalify things that I really need to get done. Or something like that. 4. Metro Medallion needs batting patched together, backing to be worked out and then quilted. 5. Almonds baby quilt needs to be quilted and bound. The last three are not as pressing goals and I may work on other stuff this quarter – I have a cowl and a sweater on the needles and a HST wedding chuppah to make for my best friend before next May and a baby quilt with pattern but no fabric… But them’s the plans! Linking up with the Finish Along link party at The Littlest Thistle. It is that goal-setting time of year again for the Finish Along at Littlest Thistle! This quarter’s goals feel lofty. 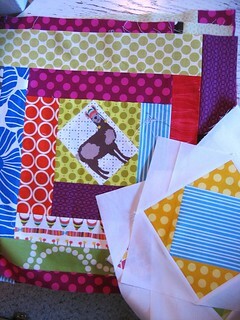 Last quarter, I had tops and backs and batting all set to be quilted, so finishing the quilts was No Big Deal. 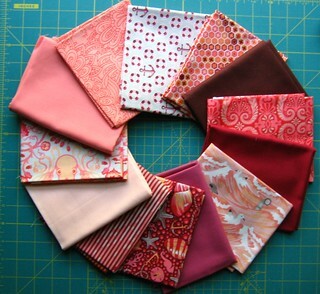 This quarter, I have stacks of fabric and ideas. First up, Metro Rings out of Botanics and Pure Elements with some custom quilting. This is the only project with a hard deadline, as it is for a friend getting married in October (or her shower, whenever that is). I’ve wanted to work with Botanics for a while, and B & G will be decorating their home in greens, blues, oranges, and yellows. 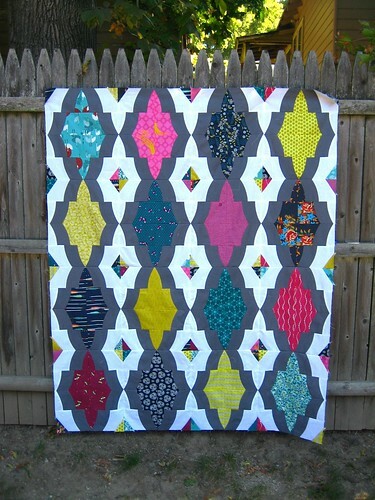 The facing triangles will be orange and yellow, and I’m going to add a wide grey border similar to this quilt. Finishing the top is my July Lovely Year of Finishes goal. Next, I want to finally do something with these leftover blocks from LLamas in Log Cabins. 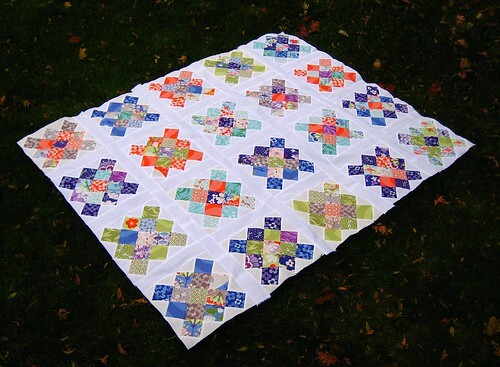 My idea is to make some flying geese to sit between the blocks and then add a couple of borders, medallion-style to make the finished piece larger. 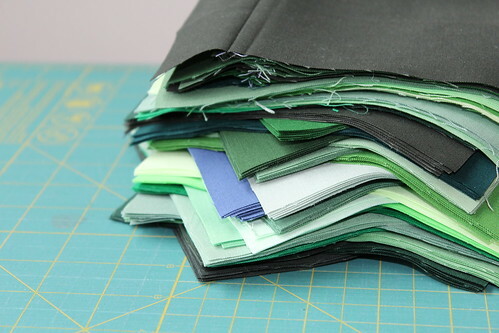 I’ve had this gorgeous Salt Water and coordinating solids stack on the top of the fabric pile for months, and I think it is time to sew them into a Honey quilt from Elizabeth Hartman’s second book, Modern Patchwork. My last amorphous goal is to do something with this lovely Acacia and solids stack. I’m open to suggestions – maybe hexagons or a kaleidoscope? This all seems a bit daunting, yes? 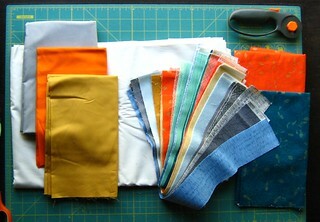 Better start cutting fabric! 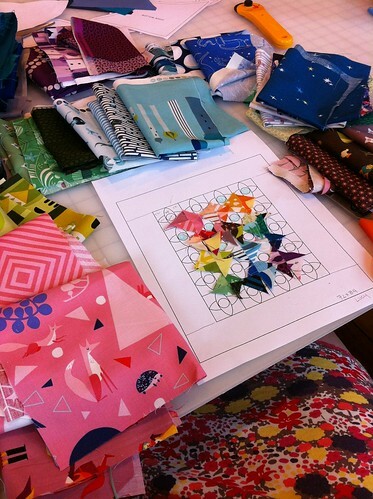 I have big plans for this spring: I want to become a more confident quilter. I’ve quilted both on a home sewing machine and on a longarm at a studio, but I haven’t strayed far beyond basic stipple, straight line, or loopy line. I’m taking Leah Day’s Craftsy class, which is really encouraging me to move beyond those three techniques and also mix different patterns in one top. With that in mind, goal number one: finally finish Spring Stripes II. Here is the most recent picture of it. Friends, that picture is nearly two years old. And I’ve never taken a picture of the completed top, because I’m a bad blogger, but it looks just like Spring Stripes I but with the warmer colors from Lotta Jansdotter’s ECHO collection. 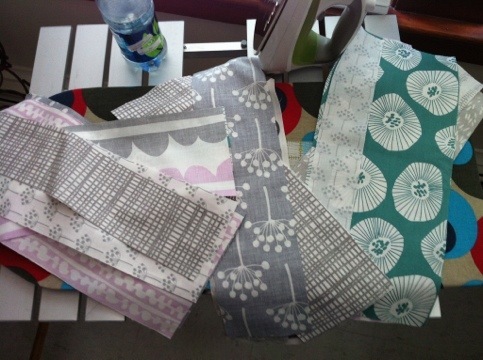 I’m planning to use a different FMQ technique for every stripe. This is my Lovely Year of Finishes goal for April. 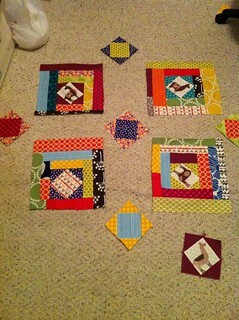 Goal number two: quilt and bind Fortunate Granny. Again, I have the back finished. I haven’t yet decided how this one will be quilted, but I’m thinking maybe an orange peel pattern in the blocks and a filler in the background. Goal three: Requilt Foxes out my Window, because it has to be done and I’ve been putting it off for a while. 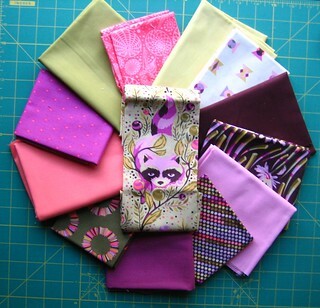 Stretch goal four: Finish the Craftsy mystery quilt with Tula Pink’s Fox Field. I’m way not sure if I’ll make this by the end of June; that’s why it is a stretch goal! Those are my four main quilty WIPs for this quarter, and my ducks are in enough of a row for me to participate in the 2014 Finish Along at The Littlest Thistle!